When questions arise, please feel free to contact our Customer Service Representatives from 8:00 am to 8:00 pm EST Monday through Friday. The main CS number is (703) 406-2800, extension #5. After 5 pm EST, please use extension #6. We typically answer most datalogger, transmitter, sensor & interface questions on the first call. If we cannot quickly answer a question on an interface, we will work with you until we find a solution. If your question is application or system related, we can still have your answer by consulting with our Integrated Systems & Engineering Divisions. Expedited repairs can be completed within one (1) week for an additional fee. Of course not all problems can be fixed over the phone. Sometimes a customer needs an on-site technician to identify site related problems or troubleshoot a network. Sutron provides these services at a reasonable cost. Please call for details. Training is an important part of the Sutron Customer Service Success. We frequently provide on-site introductory training at our Customers’ facilities. We also hold three (3) day training seminars at our Sutron headquarters in Sterling (near Washington, DC). Contact us for details. Proper installation, maintenance, training & consistent support from the manufacturer are the keys to station longevity. 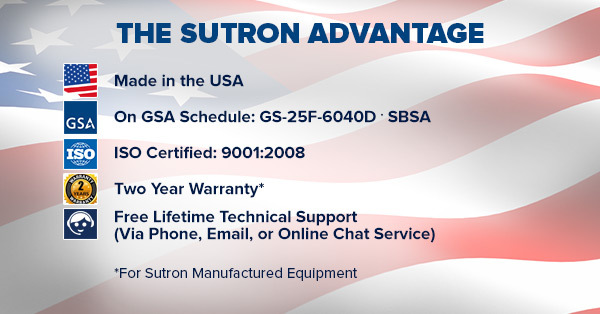 Sutron Corporation guarantees that equipment manufactured by Sutron’s Production Division will receive support (phone, email, Skype, GoToMeeting) for the lifetime of the instrumentation, even beyond the Warranty period. * Some restrictions apply. 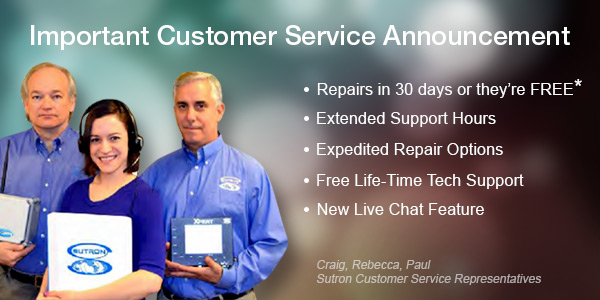 Please refer to entire 2014 Sutron Customer Service Policy.